"Love 'n Life" is an upbeat, folk-ish, helpful/hopeful, look at love and life that will lift the spirits and remind a soul that love still works. 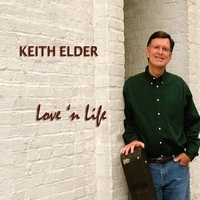 Singer, songwriter, retreat leader--Keith Elder has spoken and performed for over thirty years in a wide variety of church, conference, and community settings. While serving local churches in North Alabama as a youth director then as a pastor, Keith continued to write and record, play small concert venues, and provide leadership for special events. Speaking of music... Keith has recorded six full album projects, with the latest, "Love 'n Life," being released in September, 2013. Besides many theme songs for service organizations and special events, he has also written and produced several small-scale musicals. Keith's songs are life/people songs crossing the lines of Christian, Folk/Americana, Musical Theater, and borderline Bluegrass. He says he just writes what come out on a given day. Call him "genre-challenged," but these days he is shooting for an honest word, a compelling story, and a fitting musical form to carry the message. Probably his favorite songwriter quote comes from the legendary Roger Miller: "Songwriting is easy. It's like taking candy...from a bear."